An instructor at the Amazon Plant Conservation Center in Ecuador demonstrates the use of nitrogen-fixing trees to improve soil fertility. All Garden research is conducted in partnership with host countries to help strengthen their botanical institutions and conservation efforts. 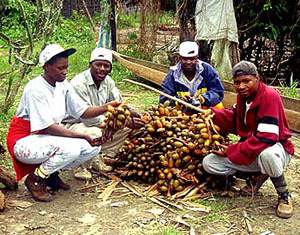 Shown: A collecting expedition in Congo.